To non-residents of Tagaytay, are you tired of saying the same thing whenever you go to Tagaytay? Do you want to try other restaurants and cafes that will make you crave for something else besides Bulalo when you think of Tagaytay? If you answered yes to both, then you came to the right page. Tagaytay is known to be a go-to place every weekend or holiday or any day, actually, because of the cold breeze that has easily become every Filipino’s craving. It is also a great quick escape or a safe haven that Filipinos go to for horseback riding, sightseeing, and eating their famous bulalo. There are just so many places that you can go to and things you can do when in Tagaytay. Through the years. however, more urban dwellers have chosen to live and stay in Tagaytay. Its proximity to the city and idyllic setting makes it the perfect home. Envisioned to be a relaxing haven, Serin Tagaytay is Avida’s first project in a leisure destination – and it is the perfect home for weekenders, families, and retirees. For Tagaytay residents, it is just as important to look for the best dining spots as it is to look for a dream home. Therefore, Avida Land has brought its unique food challenge, the Avida Serin Food Hunt, to Tagaytay. 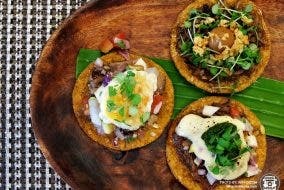 To non-residents of Tagaytay, it is also important to note these new and undiscovered restaurants and cafes because I swear they are worth checking out! Located along Silang Highway, you can spot Caffè Sant’Antonio and Rogate Center. Run by Rogationist priests headed by Fr. Rene Ramirez who studied and lived in Italy for several years, the Rogate Center put up San Antonio Cafe, a small cafe that served coffee and pastries in 2012. Later on in December 2013, they expanded and opened San Antonio Pizzeria. This is not just your ordinary pizzeria, though; it favors authentic wood-smoked, stone-baked Roman-style pizza. It is actually making me drool while I write this article. I can still remember how good every bite was! This is the first plate that we finished in less than a minute or so. I guess, the people I was with loved it as much as I did. Bonus: Guests can tour the small workshop where the locals make the saints’ images. According to Father Rene, their most popular image would be the one of St. Pedro Calungsod. They are also popular for producing miniatures of saints. These miniatures started as an activity for the children of San Antonio Parish in Forbes Park to make them interested in saints and to help the workers at the same time. Now, it is something that they produce on a regular basis. What’s interesting about Gabriela is their new salad and herb garden. Did you know that you can pick your own salad ingredients and have it served fresh? Oh my gulay! This is kuya picking the fresh veggies that my friend asked for his salad. Located in Magallanes Drive, the whole stretch of Nurture Wellness Village features a restaurant, farm, and spa which make for a perfectly relaxing respite from big city worries while sampling these staples in their menu: Fresh Salad & Tea, Chicken Arroz Caldo, and assorted Filipino rice cakes. My co-WIM writer, Derick Flores’ salad fresh from FARMacy. Their delicious Pandan Ice Tea which you shouldn’t miss! It became my instant fave! Bonus: When you’re done eating, you can avail of their massage services. I was massaged after I ate and it was the best massage ever because I could hear the cold breeze, the dancing trees, and the rustle of leaves while getting it. It was as if the nature was imploring me to stay. Click on the next page for more restaurants to check out! Papa John’s BIG TIME TREAT in Tomas Morato! 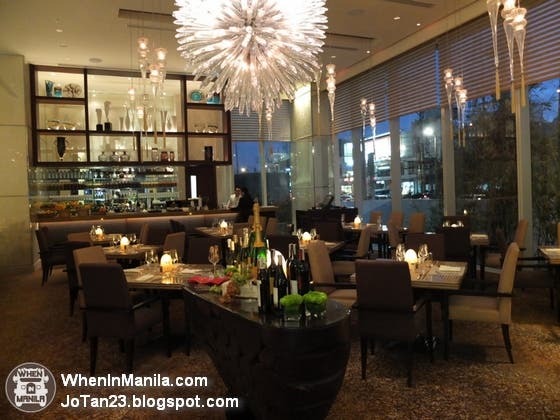 Spectrum Cafe and Restaurant – intimate dining in the middle of busy Makati City!